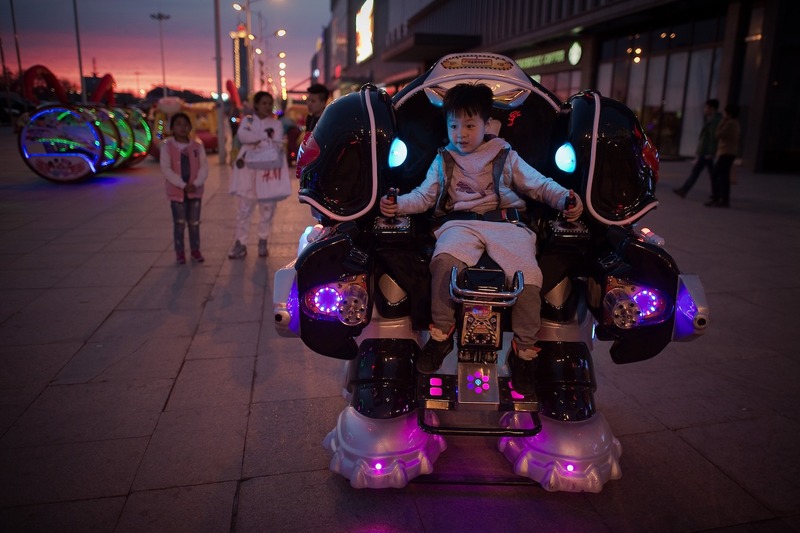 A boy rides a robot style vehicle outside a shopping mall in Daqing, Heilongjiang province on May 2, 2016. Can China Become a Leader of Innovation? In many industrial countries, China is not seen as an innovator. It remains a common narrative that creativity in China is stifled by state intervention, and that the technology gap is so huge that China’s industry will not be able to catch up with the technological level of advanced economies in the foreseeable future. Industry leaders who make this assumption may be in for a surprise. Chances are good that China will successfully increase its technological level, with tangible results even within the next few years. With its smart and forward-looking Made in China 2025 strategy, China is on target for advancing to a “manufacturing superpower” by 2049. The ambitious industrial plan has the potential to elevate the technological capabilities of its industry and to modernize the outdated production facilities through smart manufacturing. The strategy is backed by immense funding, and there is huge enthusiasm among local governments for promoting industries such as robotics, big data, and electric vehicles. Made in China 2025 is of course not immune to the problems of top-down industrial policy. A huge part of the funding will likely not generate the envisioned effect or will even create misguided incentives for enterprises. Hyperactive local governments will lead to even more overcapacities and a focus on quantity rather than quality. But despite these weaknesses, China’s industrial policy will have an overall positive effect on innovation and the diffusion of new technologies. Even if a large mass of enterprises will not be able to effectively use government support, the policy will create a vanguard of highly skilled and competitive enterprises. These front-runners will be able to compete with established multinational corporations—in China and on global markets. More innovation and competition from China should be a welcome development for the global economy. But the plan driving it comes with strings attached. Made in China 2025 will not roll out under free market conditions, but pursues the clearly-stated goal to promote Chinese industries at the expense of their foreign models and foreign competitors. The policy increases government interference and encourages market distortions by providing massive subsidies to domestic companies, by introducing rigid public-procurement rules for foreigners and by state-led investments in foreign technologies. In the short term, Made in China 2025 will create new opportunities for foreign businesses in China. However, in the long term, the strategy is aimed at technology substitution. China seeks to lead in those high-tech industries that are the foundation of economic growth in industrial countries, such as automotive, aviation, machinery, and information technology. If Made in China 2025 unfolds as planned by the Chinese leadership, it will present a threat to the economic prosperity of industrial countries. These countries will need smart responses to China’s state-led effort if they want to secure a level playing field in the future. Wübbeke is right that those who ignore China’s technological capacity are burying their heads in sand. The truth is that China is rapidly closing the technological gaps with the West across many sectors. The rate may vary, but the overall trend is unmistakable. However, the question whether China’s industrial policy undermines Western technological leadership is harder to answer, because it involves two related questions: First, is industrial policy in China responsible for its technological advance? Second, could Western companies adjust their strategies to remain leaders with a fasting approaching China? In a volume I co-edited, published by Oxford University Press in 2016, China as an Innovation Nation, a group of experts reports analysis of 10 high-tech sectors in China, including traditional industries such as machine tools, railroad, automobile, rapidly changing and globally integrated information communication technology (ICT), and new energy industries. Our findings are revealing in these two questions. First, while industrial policies have been a favorable tool for the Chinese government with the goal of catching up with the West, it is far from clear that these policies are responsible for the dynamism in China’s industry. For example, the state policy of creating giant state-owned companies or joint-ventures as the industrial leaders succeeded only in the high-speed rail, due to the exceptional nature of railroad, but largely failed in automobile and semiconductor sectors, which have intense international competition and fast technological changes. China’s support for renewable energy jumped-started the wind and solar industry, but has also created so much excess capacity as to destabilize the industry worldwide, damaging many Chinese companies. In the ICT sectors, state policies took varied forms of technology standards, public procurement, or preferential tax, etc. Yet, it is difficult to gauge their effectiveness. Except for the state monopoly in telecomm services, the leading firms in ICT such as Tencent, Alibaba, Baidu, and Huawei are non-state companies whose strength grew due to intense domestic and global market competition. In 2016, there was a great debate between two leading economists, Justin Lin and Weiying Zhang, on industrial policies, with Lin supporting them and Zhang thinking that the policies are completely useless. This debate was needlessly polarized, but it shows Chinese scholars do not have a consensus on the contribution of industrial policies. We believe that the Chinese government has done well in investing in infrastructure, research and development, and education, and in creating a favorable climate for new industry, but the government does not deserve all the credit. China’s technological dynamism is shaped by both top-down initiatives by the state and bottom-up competition by market. Second, Western firms will lose their leading status if leadership is defined in static terms or these firms are complacent about competition from China. But leadership is not just about keeping ahead, but also about the ability to create new fields, and make strategic adjustments to form new competence and new alliances. Thus far, Chinese firms remain followers in most industries, not only due to their lower technological level, but also because they target the middle-level market while Western industrial leaders occupy the premium segment. Foreign companies can do well in China by focusing on the high-end market while setting industrial trends and standards. Furthermore, Chinese firms are good at system integration, so they take parts and systems from different leading companies to put them into products selling to the massive Chinese market. This way, the success of Chinese firms in fact brings bigger market share to those foreign companies producing the parts. Remaining leaders in this world may actually involve working with Chinese companies. As the world changes, leadership will constantly be redefined. Both Chinese and Western firms will need to work harder to stay on or move to the top. Wübbeke and Zhou are right that China’s innovative capacity has been on the rise and that China’s innovation system is still state-led. However, when we talk about “China’s innovation” in a knowledge-based and globalized economy, we have to first figure out what “China” and “innovation” mean. Specifically, we need to call into question things such as whether China owns the innovation in its geographical territory and in what sense China is innovative. With these in mind, we may see a different picture of China’s innovation. First, indeed, China has an ambitious high-tech development strategy, but high-tech development does not automatically bring about innovation. In recent decades, the Chinese government has launched high-tech development every five years, and issued from time to time some national strategies, such as Made in China 2025 and Mass Entrepreneurship and Mass Innovation. Started from scratch, China has become the world’s largest exporter of high-tech products. However, such a fact does not necessarily reflect China’s indigenous innovation capability in high technology. In fact, foreign-invested enterprises (FIEs), including wholly-owned foreign enterprises and joint ventures, have dominated the exports of China’s high-tech products, although their share decreased to 72.1 percent in 2013 from 79.3 percent in 2002. The share of high-tech exports from state-owned enterprises (SOEs) also sharply dropped to 5.6 percent in 2013, while the share of other enterprises, particularly private enterprises, increased to 22.2 percent from 5.7 percent in 2002, indicating the gradual but rapid coming of age of the private sector in China’s high-tech industries. Second, China’s ICT sector is probably the most innovative, having the smallest gap with global leaders. The issue is that Chinese firms do not necessarily own core competencies. Just as Zhou mentioned, in addition to state monopolies of China Mobile, China Unicom, and China Telecom in telecomm services, there are also leading firms such as Baidu, Tencent, Alibaba (BAT), Huawei, and Xiaomi. The draft of the Foreign Investment Law, proposed by the Ministry of Commerce (MOFCOM) in January 2015, categorized entities established in China but ‘‘controlled’’ by foreign investors as FIEs. Accordingly, neither BAT nor Xiaomi are Chinese firms. When we talk about innovation in China, Huawei is an indispensable case. However, Huawei is not typical. Yes, it is not an SOE, not a joint venture; yes, it is highly R&D-intensified; and yes, it has been developing indigenous technologies and an international market. But the company mainly has pursued customer-oriented innovation. For example, China’s smartphone market leaders such as OPPO, Vivo, Xiaomi, Lenovo, and ZTE, among others, depend on non-Chinese suppliers for key technologies. Enter Huawei, an outlier with its semiconductor subsidiary, HiSilicon, providing chips used in its smartphones. However, the global market is still dominated by the U.S. through Apple and the Qualcomm/Android model with Apple taking away some 90 percent of the global smartphone profit. Lastly, there are different types of innovation. Some argue that we are in an exciting innovative era, as new technologies, new business models, and startups are emerging constantly; others consider that we are in a poor innovation era with no revolutionary breakthroughs. This can be applied to the discussion of innovation in China. In its 2015 report, “The China Effect on Global Innovation,” McKinsey, the consultancy, proposes four archetypes of innovation: customer-focused innovation, efficiency-driven innovation, engineering-based innovation, and science-based innovation. As Zhou said, China has a small share of the global market in the industries where innovation requires original inventions or engineering breakthroughs, such as branded pharmaceuticals and automobiles. This reflects China’s innovative gaps with the West. China is flourishing in industries where innovation is about meeting unmet consumer needs or driving efficiencies in manufacturing such as appliances and solar panels. China’s massive consumer market and unmatched manufacturing ecosystem give the country unique advantages in these sectors. However, customer-focused and efficiency-driven innovation as exploitative activities are easier to achieve than the explorative innovation based on engineering and science. Transformation from exploitative to explorative innovation represents a process of technological catching-up. But, this will not be a smooth and short process. It is in this sense that a discussion of China as a leader of innovation is probably a bit premature.